Mix up a batch of this delicious, versatile concoction and enjoy all week long as a snack on crackers, sandwich or as a topper on your baked potato. Say pimento cheese sandwich in Texas and you have an instant argument. 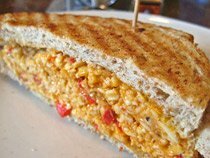 Pimento cheese dates back to the popular tea sandwich of the early 1900s. Today there are as many variations of this sandwich as there are Texans. Pimento cheese is used on crackers, sandwiches, celery sticks, baked potatoes and stuffed jalapeno peppers. My pimento cheese recipe is an heirloom and will be a smart addition to your easy sandwich recipe file. It's a snap to make and far better than what's available at the supermarket. A generous sandwich is only 350-400 calories while a smaller more elegant tea sandwich is only 150 calories. NOTE: I've tried using reduced fat cheese in this recipe with disastrous results. The flavor and texture of reduced fat cheese ruins the taste. For variations try longhorn cheese. Add finely chopped green, yellow or red peppers. Or kick up the heat with minced pickled jalapeno, or other pepper of choice. CALORIES: One generous sandwich is approximately 350-400 calories. Mix all ingredients well. Spread on bread with the crusts cut off and slice in half. Go to SANDWICH SOLUTIONS --Sandwich Recipes.